Global climate change is clearly acknowledged to pose risks to California’s water, though the focus has primarily been on water supply-side changes (e.g. decreased snowpack, earlier snowmelt, and more extreme floods and droughts). Yet along with these shifts in the quantity, timing, and reliability of freshwater supplies, climate change will also have important impacts on water demand. In particular, increased temperatures and altered precipitation patterns will affect the evapo-transpiration of plants and thus, total outdoor water demand. In addition, increased temperatures will impact cooling requirements, and therefore total indoor water demand. At the same time, a variety of other factors will continue to influence water demand such as population growth, development patterns (e.g., where the population grows), changes to the state’s industrial mix and employment (e.g., manufacturing jobs being replaced by service jobs), and on-going water conservation programs and standards (e.g., 20% reduction in per capita water use by 2020 and new water-use efficiency standards for fixtures and appliances). The official California Water Plan process increasingly explores scenarios of different water futures as a way to better understand the scope of water problems and the ability of various water response packages to address those problems. The 2005 Water Plan explicitly addressed several important new responses in more detail than previous efforts, but recommended that additional efforts be made to expand both the scope and detail of the scenarios. In recent years, the Pacific Institute has developed and analyzed independent assessments of the potential for water-use efficiency with support from the Department of Water Resources. DWR’s support enabled the Institute to develop estimates of efficiency potential in the commercial, industrial, and institutional sectors. Here, we expand on that work with additional scenario studies on urban efficiency. No “predictions” are made – instead, the Institute has developed transparent scenarios and a tool that can be widely used to test hypotheses, data, and assumptions on driving forces for urban demand. In addition, new modules related to climate change and impacts on water demand, an area of growing interest, will be developed and tested. The Pacific Institute is currently developing a tool that will make it easier for state agencies, water utilities, and others to explore scenarios of future water use, identify possible efficiency options, and capture economically desirable water conservation opportunities. Researchers Matthew Heberger and Juliet Christian-Smith presented a poster at this year’s Fall Meeting of the American Geophysical Union, an annual gathering of earth scientists in San Francisco attended by over 19,000. The poster, titled “How Much Will We Use? 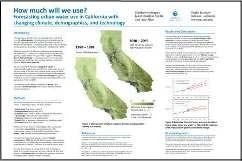 Forecasting urban water use in California with changing climate, demographics, and technology,” describes an ongoing project funded by California’s Department of Water Resources. Funding for the project was originally approved by California voters through Proposition 50, the “Water Security, Clean Drinking Water, Coastal and Beach Protection Act of 2002”. The Institute will publish a set of urban water use projections in the spring of 2011. This project fills a critical gap by evaluating a range of scenarios of future urban water demand in the context of climate projections. The study will also create a tool for water managers to compare different future scenarios by altering the greenhouse gas emissions scenario, the level of implementation of best water management practices, increased use of recycled water, and setting rules such as requiring dry cooling in industrial processes. This study is one of the first to examine how water demand will change climate change. This report will develop a comprehensive set of water planning scenarios to integrate water-use efficiency options and the potential risks of climate change for California’s water demand to 2050. View the poster presented at the Fall 2010 AGU Meeting here.